WASHINGTON — Members of the Oklahoma congressional delegation were pleased with President Donald Trump’s message of bipartisanship and unity in the State of the Union address Tuesday night, including on issues that affect Oklahomans. Rep. Kevin Hern (R-OK1) said in a statement that it is time to heal political divides and that there are many issues in front of Congress that have bipartisan support. The president offered a chance for Congress to work together to “accomplish great things for the American people,” Rep. Markwayne Mullin (R-OK2) said in a statement. Rep. Tom Cole (R-OK4) issued a statement that he hopes Democrats will embrace the goals Trump outlined, saying they unify Americans. While the beginning and end of Trump’s speech (video above) trumpeted bipartisanship, the address touched on divisive issues, such as border security and abortion. Topics with strong Oklahoma ties received mentions, but some of the national themes Trump spoke about also have significance in the Sooner state. The president talked about the need for an agenda that worked for all Americans and the importance of winning for the country over winning for a party. He said Congress needed to choose whether it wanted to let differences define it, or to transcend those differences. Trump spoke about bipartisan efforts for criminal justice reform, touting successes and the importance of reforming sentencing for nonviolent drug offenders. 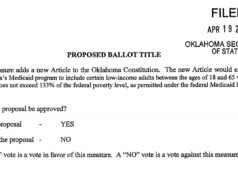 Oklahoma is one such state takes steps forward on the issue. Criminal justice reform was one of the topics Gov. Kevin Stitt talked about in his State of the State address Monday. Stitt called on lawmakers to reimagine the state’s system, promoting his budget requests for criminal justice reform initiatives. Oklahoma has the highest rate of incarceration in the country, according to the Prison Policy Initiative. Trump talked about a “boom” in the U.S. economy and 5.3 million new jobs he said have been created in the last two years. Sen. Lankford said he thinks the economic conversation will have the greatest impact on all Americans. “I thought he was bringing news to people, to say, ‘Hey, the economy really is moving. If you feel it moving, it really is,” Lankford said. Military spending was also a brief topic in the speech. With six bases in the state, U.S. Sen. Jim Inhofe (R-OK), chairman of the Senate Committee on Armed Services, said funding the United States military is a key issue for Oklahomans and that people in the state have been attuned to military cuts that took place under the previous administration. Rep. Kendra Horn (D-OK5), who serves on the House Committee on Armed Services, said she looks forward to working on issues important to the armed forces and supporting them. The space industry has strong ties to Oklahoma, with Horn being named the chairwoman of the House subcommittee on space and aeronautics and former Oklahoma Rep. Jim Bridenstine heading NASA. Horn said she was excited to hear the president talk about America’s return to space. While bipartisanship was a theme for the night, the House chamber felt as divided as ever. There was a stark contrast in the the way members on either side of the aisle looked, as the Republican side was mostly filled with men in dark suits and the Democratic side was a sea of women in white, who stood out prominently in the center of their section among the men. Horn was among the women wearing white, a reference to the suffrage movement that pushed for women’s right to vote. The 116th Congress has more women members than any in history, with 102 women serving in the House of Representatives. Horn, who is only the third woman to represent Oklahoma in Washington, is one of 35 freshmen women this term. Trump noted the historic moment in his speech, and Horn was among those cheering. With a divided government for the first time in his presidency, it will remain to be seen whether or not Trump’s message of bipartisanship rings true after the longest government shutdown in American history ended recently and members of Congress work with the president to reach a deal on border security funding before the Feb. 15 deadline that could trigger another shutdown. “I was glad to hear the president talk about bipartisanship, the need to reach across the aisle, and I certainly hope that he means that and will continue to follow through,” Horn said.